Cambodia, a country with a foreign culture for us, attracts millions of tourists every year. Especially the temples around Angkor Wat are what people from all over the world want to discover. 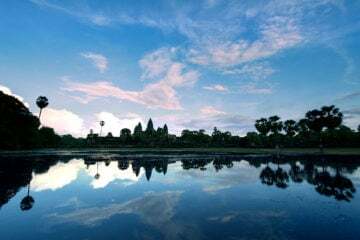 On our blog “Visit Angkor” we have compiled many tips helping travelers to find their way to the most important events in this exciting country. Read about the cultural differences as well as which travel time is the most suitable and why this is so. Know the different travel routes to Siem Reap and learn to know already various temples of Angkor Wat in advance. Enjoy the culinary highlights of the Cambodian cuisine and look forward to many attractions that Siem Reap has to offer. Don’t miss any of our blog posts and subscribe to our feed. You think you should travel during the dry season ? Also the wet season is very nice, experiencing a fresh green landscape everywhere. Get information on our webpage about climate conditions in Cambodia and visit this page. You will find foreign customs all over Asia and also in Cambodia. Best you inform yourself before you travel, which attitude you should follow to avoid irritations in different situations. Find our tips on this page. There are different possibilities for arrival. You can go direct by airplane, or via Bangkok or Phnom Penh. It depends very much on your available money and the ability to accept adventure. If you go to Cambodia you need a Visa. At some border crossing like the international airports Siem Reap and Phnom Penh you can get a Visa on Arrival. Get information about this topic under Visa.